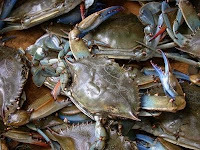 I love Maryland crabs. Even more than I love Maryland venison. And I do love eating the deer. But I think steamed blue crab may be the most delicious food in the world. ...and then received #3 females. The worst part is the fish guy she bought them from wasn't trying to rip her off. He was just ripped off himself. Such is life buying crabs here in New York City. People just don't know crabs. But then I think she paid only $80 a bushel, which is way too cheap for jimmies, right? Steaming the crabs is always great fun (for us, not the crabs), as the crabs are feisty and one or two always gets loose. At least most of the guests, not knowing backfin from lump, didn't know they were eating very small crabs. And despite their size, they did taste great. Afterward, with Old Bay in the air and three of us sitting around a table drinking and picking, we probably ended up with less than 2 lbs of crab meat from a while damn bushel of crabs (many in this bushel were dead). Pretty pathetic. But crab meat is crab meat. So we had crab cakes tonight! My wife went first. Fine by me! I had a beer. But then I came to face-to-face with this pan-fried hockey-puck shaped thing and my heart sank (though they tasted OK). Is there something about New York that makes people want to mash delicious crabmeat into patties? Is there something in our water? So I took the rest of the meat and let me tell you, I showed her. Round, as loosely packed as possible, and broiled. The sad truth is they looked better than they tasted (I used too much egg). But not bad for a New York boy winging it with a point to prove. We were both loosely following Ms. Amelia's crab cake recipe. Though next time I might try this recipe because I love Faidley's and I like the idea of little worcestershire sauce addition. Speaking of food. If you see the movie "Julie and Julia" (decent, though very very chick-flick), it's all filmed in my Astoria neighborhood (which subbed for nearby Long Island City). I stopped by my corner fish store and congratulated them (not where the crabs were from, by the way) and K & T Butchers is only a few blocks away. Once I ran into Julie at a liquor store near her house. Alas, to my great dismay when I lived in Cambridge, I never did run into Julia Child (even though all my friends did). I just want to make it good and clear that my crab cakes _tasted_ better! Next time, fine, I'll shape 'em nicer, now that I've been schooled. Whatever, woman. I should hope so. 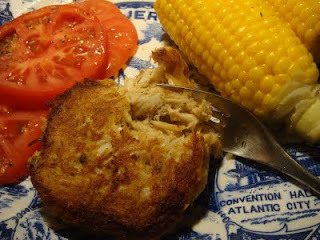 Just because you have an amazing cookbook coming out doesn't mean you have to get all uppity about the crabcakes!